My research has a focus on understanding inflammation in airways disease and in particular neutrophilic inflammation. Neutrophils are an important white blood cell that are involved in fighting invasions such as infection. In some patients with airways disease, neutrophils persist in the airways and this can result in excessive inflammation and poor lung function. Understanding the triggers of neutrophilic inflammation such as infection and air pollution. Investigating new treatments for airways disease that target neutrophilic inflammation such as macrolide antibiotics. Identifying the mechanisms of neutrophilic inflammation - once we understand how neutrophilic inflammation works we may be able to try and reduce it. I guess research for me was something I fell upon with a love for science and a desire to understand how things happen. After completing my undergraduate science degree I started to work in Respiratory Medicine as a laboratory scientist. Soon I found a home in a small group of nurturing clinicians and scientists who fostered my inquisitive nature and helped me to pursue my PhD. Simple, to make a difference to those who suffer with lung disease. I hope to do this by working closely with clinicians at the interface between clinical practice and basic science. Professor Simpson has an established national and an increasingly international research profile in the fields of non-eosinophilic asthma, non-invasive assessment of airway inflammation and neutrophilic airways diseases. Her research output relevant to opportunity is exceptional with more than 3000 career citations, highlighting the international reputation and the impact of her research. With 82 career publications, 48 in the past 5 years (FTE) she has consistently published in the leading Respiratory and Allergy journals, evidence of my outstanding research achievements. Professor Simpson’s work represents a key feature of translational medicine that will allow tailoring of treatment for patients with asthma and COPD. During her PhD (completed in 2005), she made a number of fundamental and paradigm shifting observations with respect to classifying airways disease. Asthma was once considered a disease characterised only by eosinophilic (a type of immune cell) airway inflammation. Professor Simpson identified and characterised four inflammatory subtypes of asthma and identified that half of the patients with asthma had normal levels of eosinophilic airway inflammation, with 1/5 having a distinct neutrophilic bronchitis. This discovery changed the way inflammatory subtypes are considered in asthma and has become the gold standard for stratified medicine approaches to target current and novel therapy. She then identified a novel inflammatory mechanism that results in neutrophilic airway inflammation (innate immune dysfunction). She has extended her early investigations of the innate immune system in neutrophilic asthma, recently describing the involvement of the NALP3 inflammasome and identifying IL-1beta as a key inflammatory target. One of the other major advancements in respiratory science led by Professor Simpson has been in the area of alternative therapeutics for non-eosinophilic asthma. Following her discovery that inflammation is heterogeneous (made up of several parts) in asthma, she sought to investigate alternative therapies which could be used to combat inflammation and symptoms for the millions of suffer of asthma with non-eosinophilic inflammation. She conducted and published the first randomised controlled trials of macrolide therapy (a type of antibiotics) for patients with difficult asthma and more recently for patients with neutrophilic chronic obstructive pulmonary disease (COPD). This work has been widely accepted and has generated significant international interest and commentary from both the scientific and lay community. In 2009 she was awarded a NHMRC project grant in an Australia-wide multicentre study of macrolide antibiotics in asthma (AMAZES) which is nearing completion. At the time this was the largest project grant awarded by the NHMRC and as a chief investigator for the AMAZES study, Simpson leads the program relating to biomarkers, and both leads and manages the external collaborations in this area. 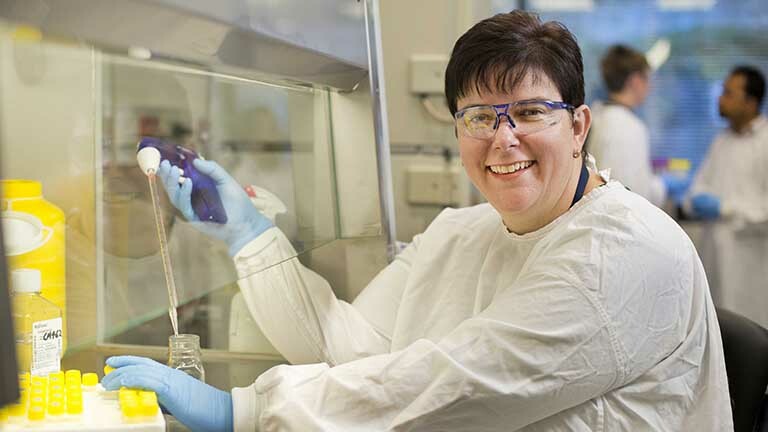 Simpson’s study of neutrophilic inflammation has naturally led her research to include the study of airway bacteria and she now leads the severe asthma microbiome and resistome project in Australia in collaboration with A/Prof Geraint Rogers and her AMAZES investigators. This data will make a significant advance in our understanding of the composition of the airway microbiome in severe asthma and is essential to our future clinical management of asthma if we are to incorporate macrolide therapy as mainstay. The ability of certain bacterial pathogens to colonise the lower airways represents a novel therapeutic opportunity and Simpson will lead a new study investigating the ability of airway phagocytes to remove pathogens and dying cells and inflammatory debris in severe asthma. Improving the health of those with airways disease through understanding the triggers and mechanisms of inflammation and the development of better treatments for those who suffer the daily burden of asthma and COPD.